Still it's very cold everyday and apparently this Feburary to March will be the coldest in whole season. We will be holding Tea Ceremony in following dates. Sakura is the tree of spring. However, there are kind of Sakura called Fudan-zakura which blooms during the winter season. This Sakura is popular in Ohara area of Kyoto, but at the corner of Oike Street and Yanaginobanba st cross, the Fudan-zakura is blooming its flower. Few more months the flowers fall, but then other Sakuras would be blooming fully. We will hold some more Tea Ceremonies during this January. Both are held between 19:00 ~ 20:00. It is Free of charge so please feel free to join us! This Sunday on 17th of January, Inter-Prefectural Women's Ekiden race will be held in Kyoto. Ekiden is relay race originates in Japan. Usually team made up by number of runners will run separated sections of cource and relay the sash to goal. This time the whole cource is 42.195km and teams are made up by 9 Female runners from Junior High School students to Adults. In our ryokan, team from Aichi prefecture are staying. http://www.kyoto-np.co.jp/kp/kyo_np/info/ekiden/09ekiden/corse.html This the route map in Japanese. The race starts from Nishikyogoku stadium, then at Kyoto International Conference Center the runners will make the turn and go back to the stadium. The race starts from 12:30 on January 17th. So if you are in Kyoto, let's cheer up Kyoto and Aichi teams! Konnichiwa! It was snowing in central Kyoto city today. Anyway, there were festival called Toka Ebisu were held in Ebisu Shrine. Ebisu, sometime written Yebisu is the God of Fishermen, good luck and working men. From 8th-12th of January, Shrine where Ebisu are enshrined will cereblate him every year. During this festival you can purchace good luck charm bamboo grass from the shrine. You will see the board like this in the street. to let him hear your wish. I found very very interesting website. You can experience the visit to famous shrines and temples in Kyoto online. At the moment they only have Kiyomizu Temple and Inari Shrine. Please watch the instruction movie first and then "Sanpai (means to visit Shrine or Temple)". PLEASE NOTE: This is a joke website. 99% of things said in the website are true, however its exaggerated or slightly changed to make it funny. We have interesting colleague in our reception office now. He is a cat. He doesn't have name yet. Okami (the mistress of Ryokan) bought this at the Fushimi Inari Shrine. On 3rd January we have done Kakizome. Firstly, there were performance by professional Caligrapher Mr. Naomi Yoshida. After that with instruction from Mr. Yoshida, we all wrote in small papers. This kakizome is still displayed in our lobby. Please feel free to come in and have a look. 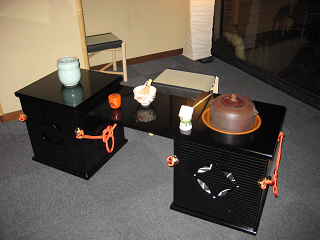 We are going to held Tea Ceremony on Feb 10th 19:00~20:00. It is free of Charge so please come in and join us. It's a greeting for the New Year. Us all staff in NISHIYAMA RYOKAN wishes you all to have a wonderful year this year!